The UK government is determined to go ahead with fracking drilling despite a consultation showing 99 percent of Britons are against it, Helen Rimmer, Friends of the Earth campaigner, told RT. RT:UK ministers have allowed a law change so fracking firms can drill under people's homes without their permission. 99 per cent of the respondents were against it, so why was it allowed? Helen Rimmer: The government has just completed what is a sham consultation. They put out proposals to allow fracking companies to drill under homes without the homeowner`s permission. Ninety-nine percent of the 40,000 people who responded are opposed and said that it should not happen. But the government is determined to go ahead with fracking despite the widespread public opposition. So now we are moving to Parliament, and it will be up to Parliament and for members of Parliament to vote through these changes. RT:The majority of UK citizens are not happy with that. In your opinion, what will be the future scenario? HR: It attracted huge opposition, around three quarters of the public have opposed to these changes and 99 percent of the people who responded to the consultation are been opposed to it. So it is political madness to play with this change. It shows that the government is more concerned about the one percent of people and the companies that stand to make money out of this industry rather than the mass of people who were opposed to it. I think if anything it is only going to further increase the opposition to fracking that we have in the UK, the industry is in its infancy here in the UK, we have only had a handful of test drills, test wells and only one frack. I think the government`s behavior over issues like these and of the next licensing round which is going to open up 60 percent of the country to potential fracking will only increase the public opposition. And we have a general election coming up in May next year, and I think it will be felt at the ballot box. RT:How will it actually work? 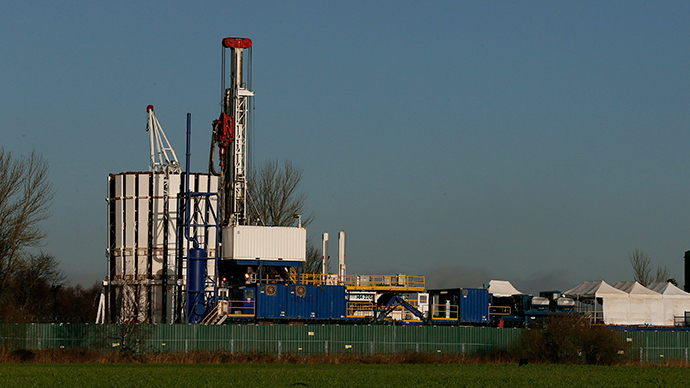 Landowners will just wake up one day to discover a drilling site in their back garden? HR: Companies will still need to get permission from the planning authorities and they will still need to get permission from local councils and also permissions from regulators such as the Environment Agency. But this means that the right of a homeowner to oppose it is being removed, which is extremely concerning from a democratic point of view. And we also know that local councils are coming under a lot of pressure from the government to actually accept and permit drilling in their areas despite huge public opposition. Just one example is in Lancashire in North-West England: at the moment there are two major fracking sites being proposed that would involve 8 wells drilled and fracked horizontally. And these have attracted 20,000 objections from local residents, also an objection from the borough council which is a very local council, and numerous parish councils. So we are calling on the local authorities who actually listen to public opinion to turn down these applications. But we know that the government is of course putting the council under a lot of pressure to permit it. RT:Those behind the idea say it allows Britain to explore the great potential of its natural gas reserves, which will help tackle high energy prices and guarantee a green future... That all sounds quite good, so where's the catch? HR: Yes, the current proposal from the industry is that one percent of revenues will be given to the community that is hosting the site. There is one company that is now proposing up to six percent of revenues would go to the community. But of course that means 94 percent of revenues actually stay with the profiting companies, not going to the community. I think communities will not be bought by this kind of proposal, if anything that will strengthen the resolve of the communities to oppose this industry. And what we are seeing is much more support for alternatives of a far better solutions for energy security and for climate through things like renewable energy and energy efficiency. I think we will continue to see support for renewables increase as we are seeing opposition to fracking increase. RT:Expanding the fracking industry will also help to create more jobs, isn't that what the country needs? HR: We do have energy problems but we think shale gas, and the majority of the public also think this, it is the wrong solution for that and we have far better alternatives with renewable energy, for example, if we were just to use a third of the available resource through offshore wind, tidal and wave. That would mean we would become a net exporter of energy. It is absolutely not the only solution that we have, and it is incredibly unpopular. There is no evidence that it will bring down energy prices. In fact, even the fracking companies are admitting that it will not affect people`s energy prices. And on the point about jobs, it will bring some jobs because every new industry does bring jobs. But we think the figures that have been put up by the industry have been vastly overestimated. If we look at the two proposals in Lancashire which I mentioned before, each of those sites according to the plans will only create 11 jobs each. This is not a bonanza of jobs that we have been promised. What we know for renewable energy, the jobs benefits are far greater. So we would much rather see the government support and the gung – ho attitude that they have on fracking going into the genuine solutions that would benefit local economies, climate change and energy security. And that is clearly renewable energy resources.